"It's never been done before so there might be some teething problems with tees because it is tricky to work out exactly where they should be, but they've really worked hard on converting driving distances to the tees we play off," says Lane. "It's a great chance for us old guys to play against these young stars. I just hope there is a good spread of players across the tours who make the cut for the last day." "It is a really exciting concept and there is a real buzz about it among the girls on tour," said the 22-year-old. "Lots of the players have asked me about the course when they knew I'd been to play it. Everyone is excited to play here." 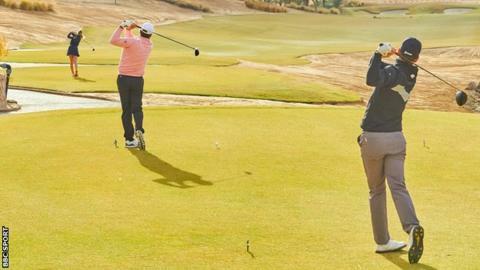 The tournament will be held three months after England's Meghan MacLaren, who will be one of the 40 LET players in Jordan, highlighted the £5m difference in the prize money between the men's and ladies events in Abu Dhabi. Former European Tour winners Michael Hoey of Northern Ireland and Germany's Marcel Siem will be two of the representatives from the Challenge Tour.